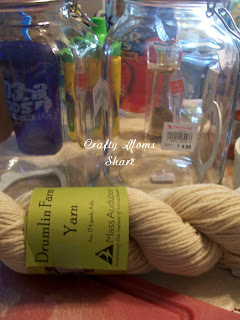 While at Drumlin Farm I saw that they were selling yarn made from their sheep's wool. This year I saw an unbleached off-white natural (white sheep) color as well as the greyish color I bought last year (a combination of the black and white sheep wool). 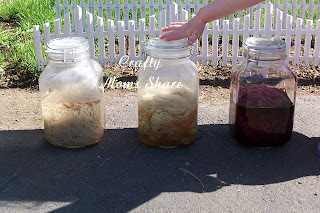 My first thought was that would be fun for experiments with natural dyes. I bought four skeins. Then the next week I bought three more after I did some research on dyeing wool yarn and talked to the handworks teacher at Hazel's Waldorf School. She suggested doing sun dyeing with Hazel and using onion skins. 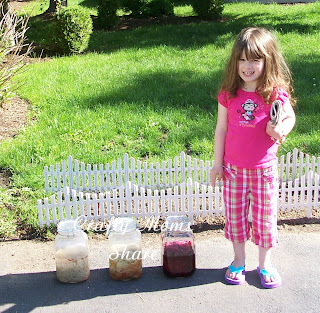 So I goggled sun dyeing and found a great blog post on Natural Suburbia. However they used food coloring instead of vegetables, so I kept looking some more. Pioneer Thinking offers some great resources including a list of what to use for each color. Lion's Brand has a neat article comparing colors that you get using a few natural dyes on wool yarn versus cotton yarn. (It got me thinking about what cotton yarn I have that I could use for a different experiment.) 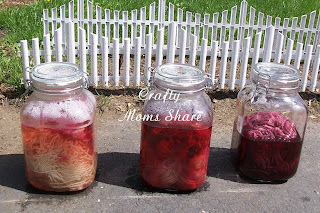 I also read several indepth articles on how to make natural dyes. I pinned all of these on my Children Crafts & Activities Board. So Hazel and I went to the grocery store for dye ingredients. Ok, we went to the grocery store several times for dye ingredients. Mostly because I kept forgetting things or getting the wrong thing and some stores carried items and some did not. I also found some great large jars at The Christmas Tree Shop. I bought three of them so I have been working three at a time. On our first day, we used yellow onion skins, red onion skin and concentrated grape juice. 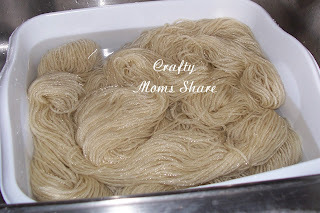 Having read so many instructions, I soaked my yarn in water with a cup of white distilled vinegar for probably about 40 minutes while I made the dyes. I took each of my onion skins and put them in a pan with water (3 parts) and vinegar (1 part). I boiled the mixture and then let it simmer for a bit. 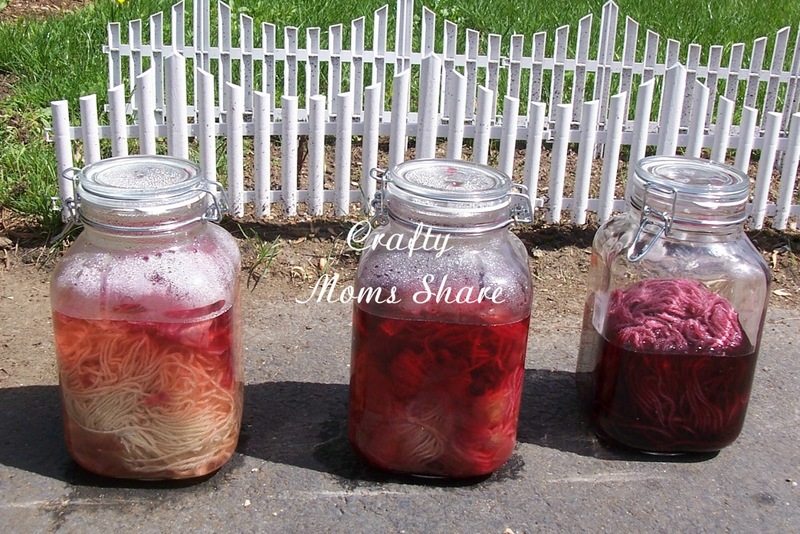 Then I poured each one into a jar and put a skein of yarn in each one. For the grape juice concentrate, I put it in a jar with a cup of vinegar and three cups of water and then added yarn. Then we put the jars in the sun for the day. I think Hazel was excited to do this since she actually was willing to pose in a picture with the jars. For our second trip to the grocery store we bought more red onion. The skin from one onion was not enough to really do much. Then we went to another grocery store for beets and frozen blueberries (only because I kept forgetting them). We added more onion skins with more water and vinegar to the red onion mixture. The yellow onion skin did not seem to be doing too much to the yarn, so we gave up on it and added blueberries with water and vinegar to that mixture. The order pictured here from left to right, red onion skins, blueberries, grape juice. We let them sit in the sun for a good part of the day. The grape juice however seemed done so I rinsed it until the water ran clear (I used the hose). Then hung it to dry. Later in the day we rinsed the other two and hung them to dry as well. The order above is blueberry, red onion skin and grape juice. The grape juice is my favorite color thus far. To see exactly how they compare to where we started. 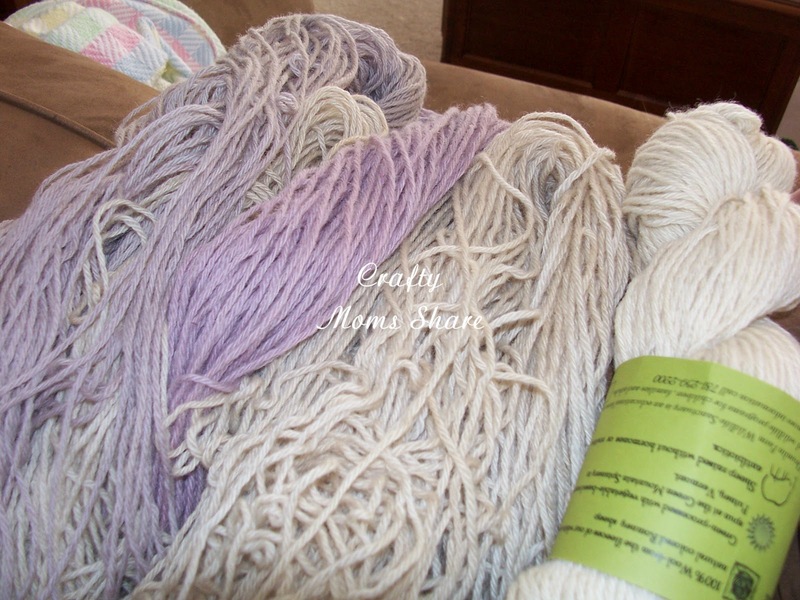 The blueberry and grape are to the left and then the red onion skin is slightly darker than the original skein. To add more educational side to this activity you could discuss the history of natural dyeing. Wikipedia provides a nice history on natural dyes. It is interesting to do something that has been done for 5000 years!! Dorthea Calverley also has a nice history more having to do with pioneers of the US. 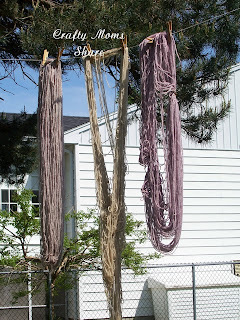 I will be sharing two more days of dyeing (at least) including some more educational ideas. To see the other days check out Day 2 and Day 3. Love love this, I want to try! Oooh, so pretty. Something I wouldn't have thought of. Gonna pin it :) Thanks for linking up to Thinky Linky Thursday! I love this! I definitely want to try this sometime. Thank you for sharing with my Super Link Party! Feel free to stop by, grab a featured button, and link up this week. Ha! Somehow I totally read these out of order...I read part 2 first, lol! I love this project and I think the idea of dying could be used in so many ways! Thanks so much for sharing at Teach Me Tuesday!! Hello, this is very good information for me as I am looking for it. Actually I like the idea dyeing wool yarn with vegetables, fruits, & flowers. I have browsed many sites, but now, I get the actual information, Thanks.